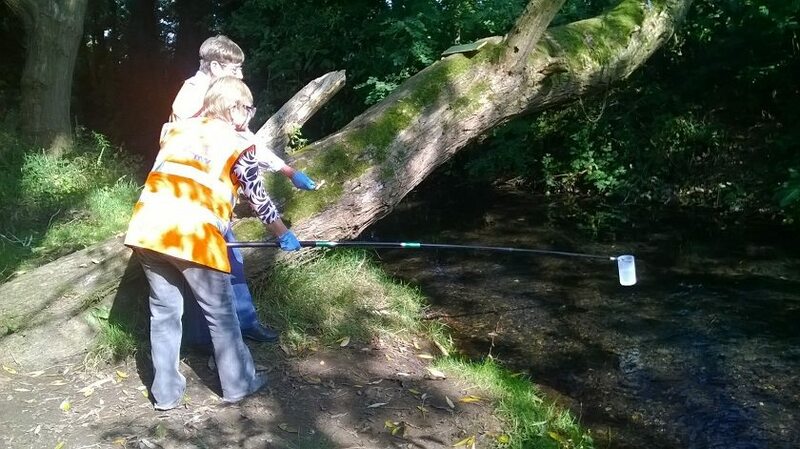 Waterside Care is part of Keep Britain Tidy and offers advice, practical support and equipment to local community groups who are interested in looking after the health of local water courses. Working in partnership with Waterside Care, FoB facilitate schoolchildren “learning outdoors” whilst having fun in and around the Moat Brook. Not only is this enjoyable for the school children it is also forms part of their national curriculum. - Designed and made their own pooh sticks for racing in the brook, competing then discussing afterwards the most successful design. - Tested the water quality. - Carried out pond dipping in which they identify the wildlife which lives in the water including bullhead fish, freshwater shrimps, mayfly and caddisfly larvae. Enjoyed a bug hunt and tree recognition activity. Waterside Care have provided pond dipping and litter picking equipment plus advice and encouragement towards helping local children learn how to care for the wildlife and environment close to their community. Every month, FoB test the water quality for turbidity, acidity, phosphate levels, ammonia temperature and flow rate. We send the results to Waterside Care who raise any concerns with the Environment Agency and Severn Trent Water. We now have over 3 years’ worth of comprehensive data relating to the water quality of Moat Brook. A large part of the project is to reduce the amount of Himalayan Balsam on the banks of the brook. Himalayan Balsam (impatiens glandulifera) is an invasive species that was introduced to Britain in the mid-19th Century by Victorian gardeners. It did not take long for the plant to escape into the wild and start growing in locations across the UK and it is now well-established on many of the country’s waterways. The plant prefers damp locations making waterway banks an ideal habitat. Himalayan Balsam grows in dense clumps and out competes native plants before dying back in the winter. This can cause problems on waterway banks as they are left bare and susceptible to erosion. This in turn can cause navigation problems for boaters and damage waterway habitats such as fish spawning beds. In 2016, with the help of Bilbrook Middle School, Codsall Community High School, Beavers, Jaguar Land Rover, local residents and NCS students, we have pulled over 30,000 strands of Balsam. It will take up to 5 years to rid the brook of the problem so please, if you can, come along and help us, it’s an enormous project. Look out on our Facebook page for details of events in the Summer. We have ambitious plans to improve some of the stretches of the brook in partnership with the Environment Agency and Staffordshire Wildlife Trust. This involves tree felling and river restoration work which will restore natural meanders and provide spawning grounds for fish.